Several times a year, Trader Joe’s distributes retail flyers to neighborhoods surrounding the stores, and it runs radio ads in some markets. Technically, even the hand-drawn signs in the store are advertising, but none of that is ‘brand advertising’. It uses an ad agency for help on its web site. In any case, as a percentage of sales, TJ’s ad budget is trivial. It doesn't even have an official Twitter feed or Facebook page. The proof that the brand thrives independent of that very limited advertising is that the Kansas City store where I worked opened to a frenzy of shoppers, before anyone there had ever laid eyes on a Fearless Flyer or heard a TJ’s radio ad. Trader Joe’s CEO Dan Bane says, “We’re a product-driven company” but you claim that the Trader Joe’s success is not the result of people just loving the products. How can you tell Trader Joe’s devoted fans that the brand’s not based on their favorite products? Every customer is the final authority on on how much they like any given product. I’m just an authority on why they think what they think. The genius of founder Joe Coulombe was to create a cultural brand that colors the way customers evaluate those products. Bane says it’s the products, I say it’s the sliding scale they’re evaluated on. Yes and no. Decades ago, the German brothers Karl and Theo Albrecht, who built the Aldi chain, split it into two separate companies. Karl owns the Aldi stores operating in Southern Europe and also the ones in the U.S.
Theo (who died a couple of years ago) owned the Aldi stores in Northern Europe. He’s bought Trader Joe’s from Joe Coulombe in the late ’70s. Technically Trader Joe’s is not an Aldi subsidiary, but it is owned by Theo’s heirs, who also own Aldi Nord. At the risk of causing confusion, Trader Joe’s and Aldi are direct competitors here in the U.S.; those two companies have no shared ownership at all. Fortune magazine once ran a story about Trader Joe’s in which they called it “a secret world”. Another journalist once dubbed TJ’s, “the Freemasons of retail.” What’s with the secretive management style? Back in the ’60s, Theo Albrecht was kidnapped and held for ransom. His family paid $12 million for his release, and that was virtually the last time he was seen in public. He turned his companies into secrecy cults. At the Trader Joe’s head office in Monrovia CA, where there’s not even a sign on building. The management’s instructions on what to do if a reporter shows up in the store are almost comically paranoid. If they’re so secretive, they can’t be too happy that you’ve written this book. Was getting a job there and then writing about them ethical? When I applied for a job as a Crew Member in Kansas City, it was because the company was growing fast, and I thought there might be an opportunity for me to apply my marketing expertise within the organization. I didn’t apply to work there in order to write the book. In the beginning I made notes on my experience there because it was so interesting to me. I quit before I actually wrote the book. That said, I didn’t conceal the fact that I’d written several other books, so they shouldn’t be too surprised. As far as Trader Joe’s was concerned, I was just a $12/hour guy hired off the street without so much as a background check, obviously, the company didn’t make me privy to its confidential information, so I couldn’t possibly betray its confidence. The book’s based on my own direct observation of Trader Joe’s customers, and the way they interact with and think about the brand. Trader Joe’s brand seems laid-back, open, and wholesome. What are the company’s ethics like behind the scenes? Trader Joe’s is definitely not a company like Patagonia, that strives for complete ethical transparency, but it’s not worse than most other $8 billion companies. On issues like farm-workers’ rights or the sustainability of fisheries, Trader Joe’s does what it’s pushed to do and usually acts when it’s been shamed in the media. What’s with the bells they ring at the cash registers? It’s what we do, instead of using a public address system. One bell is rung to call extra cashiers. Two bells are rung when a cashier needs general assistance; maybe a customer needs carry-out assistance or someone’s dropped a bottle of wine. Three bells mean a manager is needed, for a return for example. What are your most- and least-favorite products? Trader Joe’s strengths include chocolate, cut cheeses, and yogurt. The 89-cent sparkling water is a bargain. The store has a great selection of $5-$10 wines. The Triple Ginger Snaps are the crack of cookies. Weaker offerings are the famous ‘Two-Buck Chuck’ wines - you should pay twice as much, even if it means you can only drink half as much! I’m least impressed by prepared foods that are loaded with sodium, and with the company’s unwillingness to reduce products’ carbon footprints. Trader Joe’s sells Naan Bread that’s shipped frozen from India, and flies in hothouse tomatoes from Holland. So, what is the secret to their devoted, almost cult-like, following? They’re growing fast. Will they eventually dominate the grocery business? 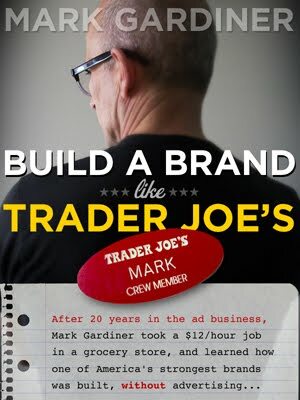 At the end of Build a Brand Like Trader Joe’s, I provide evidence that the current senior management don’t ‘get’ the genius of the founder, Joe Coulombe’s, original concept. If I’m right, it will gradually become just another grocery chain. Even if I’m wrong of course, the bigger the company gets the harder it will be to maintain that friendly, personal brand. That said, it can easily double in size in the next 20 years. When Theo Albrecht bought it, he made one of the best investments of the 20th century. It will be a great investment for his family for much of the 21st century, too. We need more Trader Joe's. We have one in Ft Worth on South Hulen. We need one off heritage Trace Parkway iff of 35 north Their brand of cereals can not be beat. they are low sodium and low sugar. Two buck chuck wine is now three bucks, but a bargain nevertheless. The cheeses are amazing. Service is wonderful. I am sure that there will be several more Trader Joe's stores in the DFW area in the next couple of years. Hi Mark, just ordered the book but am also interested to get your thoughts on TJs and social media. It some ways it seems a natural extension of encouraging the Crew Member / Customer interaction yet the brand doesn't even have a Twitter presence, something that has been commented on by customers and pundits alike. What's your thoughts on this? I'm looking forward to reading the book! No kidding! If you were going to criticize the existing Trader Joe's marketing/branding strategy -- and why would you, since the one they currently use works incredibly well, but nonetheless -- the absence of any coordinated social marketing is the single biggest area you'd point to. As you note, there's no official Twitter feed, no Pinterest, not even a Facebook page, in spite of the fact that there are lots of fan-generated ones, including a few that several-to-twenty thousand members. Trader Joe's web site, which I've heard is done by Blitz -- a hip SoCal digital agency -- does give fans the opportunity to input email or snail mail addresses, so they can get the Fearless Flyer. But when 5,000 people joined the "Bring Trader Joe's the KC metro" Facebook page alone, you can see that the company's missing an enormous opportunity to build its list. Although the web site seems to be improving (and I'm sure that Blitz would love to craft a more up to date social media program for TJ's) there are still plenty of ways it could complement and reinforce the existing cultural brand strategy. Where's the community of users trading recipes, for example? All I can surmise is that Trader Joe's devotion to secrecy trumps the potential benefits in management's mind; that the costs of running a state-of-the-art social media program are another couple of hundred grand that the owners would rather have in their pockets each year, and that, anyway, it ain't broke so they won't fix it. Thanks Mark. They're a very interesting case study in bucking the trend in social. It will be interesting to see how this plays out in the mid to long term. Cheers! That makes no sense. I saw Trader Joe's Branded stuff in Aldi in Berlin. How can they be competitors? There are two Aldi chains that are legally (and financially) completely separate. The Aldi chain operating in Berlin is Aldi Nord. It shares ownership with Trader Joe's. The Aldi chain operating in the U.S. is Aldi Sud -- owned by a different branch of the Albrecht family. So yes, there's TJ's products in Aldi Nord stores in Germany, and TJ's here in the U.S. is a competitor with Aldi in the U.S.